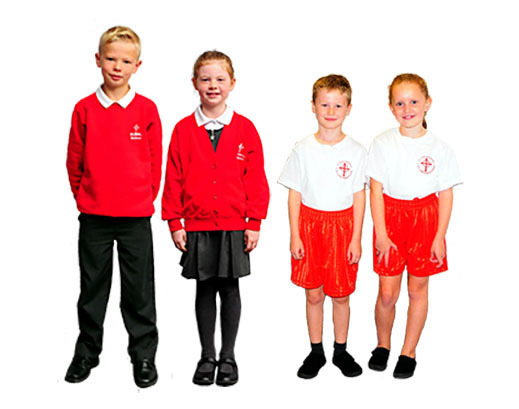 Parents are able to purchase school uniform from Touchline or Alpha School Wear. Red sweatshirt/cardigan or v neck jumper with school logo. Cardigans that do not stay on shoulders will need to be buttoned up. White shirt/polo shirt with or without school logo. These must be tucked in. Grey trousers, shorts, skirts or pinafores. Skirts should be at least knee-length. Red checked dresses may be worn in the Summer Term. Socks must be plain grey, black or white (no trainer socks). Tights must be plain grey, black or red. Shoes should be black, no sandals, boots or trainers. Indoor: Plain red shorts, plain white t shirt (with or without school logo, no sports logos), black PE pumps (no trainers). Hair that is shoulder length or longer should be tied back in a plain black or plain red bobble. Plain red or black hair band/ small bow/ small clips in addition to a bobble can be used. Bands/bobbles/bows that are large, sparkly, multi coloured, have hair extensions etc. are not to be worn for school. Hair should not be dyed nor have patterned designs shaved in. A watch and plain stud earrings only are permitted. Nail varnish and make up should not be worn. Picture transfers on skin imitating tattoos should not be worn. Our full Uniform Policy can be found in the Policies section.